N. R. Williams lives in Colorado, U.S.A. with her husband. She is delighted to have two three year old grandchildren, cousins. 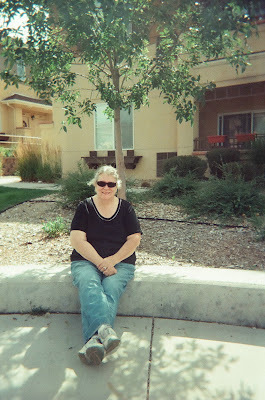 She’s a long time member of Rocky Mountain Fiction Writers and has been privileged to attend conferences and workshops. Since her formative years, she’s been inventing fantastical stories and since she could spell she’s been writing them down. While she majored in art in college, she didn’t make a living at it. Now, she uses her skills of observation to create fantastical worlds, interesting characters and stories that touch the heart. Deirdra: When did you first know you wanted to be an author? Nancy: To know and then to know are two separate things. I always had a Big imagination and searched my mother’s garden for fairies when I was young. I started writing poetry for class assignments and advanced to stories later. But it wasn’t until I experienced a traumatic event that I discovered writing as therapy and my stories took flight. Now, ideas pop into my head at nearly every turn life takes. Deirdra: What is your writing and educational background? Nancy: I failed English. Yes, I was switched from my left hand to my right and couldn’t read a thing in third grade. My mother taught me phonics, then reading and then the love of reading. But grammar was a problem for me. I guess you can say I overcame that difficulty. My major in college was art. Now I use my skills of observation to create both drawings, paintings and stories. When I catch my breath, I will add an art blog to my schedule. Deirdra: What makes you passionate about writing? Deirdra: What was the pathway like for you to get your first book published? Nancy: I self published via the fabulous e-book option and will have a regular book when money allows me to. I did try the regular route. But my high fantasy or epic as some would say; doesn’t feature dragons, vampires, werewolves or any of the other popular trends. Publishers have less and less money to pass around to unknown authors. So, after numerous rejection letters and emails all stating that they loved my story, I decided to self publish. Deirdra: Were you ever discouraged along the way? If so, how did you deal with it? Nancy: Many times. I dealt by continuing to meet with my regular critique group and to attend conferences. I did completely shelve my novel because of the rejections I received that I talked about already. I’ve heard from over 50 agents, editors, writers and readers that they loved my story. So, I am happy that now readers can purchase my e-book for only $2.99 or 2.23 pds in the UK and decide for themselves if they enjoy this series. Deirdra: What is your writing schedule like? Nancy: My schedule is sporadic. I write when I can. I have my two grown children and their children, both three, living with me. So life is a great interruption. Deirdra: Where do your ideas come from? How do you know the idea is good enough to write a book about it? Nancy: For a long time my ideas centered around my high fantasy and what would occur in that world over time. Recently I decided to write a series of novellas. I don’t have a good voice for Urban Fantasy. When I began to look for a new character to inhabit my novellas, I wanted something different then what is being done currently. I choose a phoenix heroine. As soon as I did that, it sparked my imagination. Researching the phoenix myth, I discovered that there was very little believed about them. That left the prospect of coming up with a lot of new material. Always a good thing for a writer. Deirdra: You have a unique blog schedule. Can you tell us a little about it? Nancy: I took the Blog Book Tour class from Dani Greer last summer, July 2010 and that is when I started to blog. She recommends a daily blog to build readership and let the search engines recognize you. That was my initial goal, but now I’m hooked. Although, come February, I will have a new schedule to accommodate my need to concentrate on my writing. I will still blog Sunday, Monday, Tuesday, Wednesday and Thursday. But I plan a blog writing challenge on Thursdays that I will leave up Thursday through Saturday so readers can leave comments and participate. To take the blog book tour class go here and ask. Deirdra: What do you hope readers will get from your books? Nancy: I hope they will enjoy the story, love the characters and escape their life for a little while. We are all in the entertainment business. Deirdra: What is your process of brainstorming a story? Do you just sit down and write, waiting to see what happens next? Or do you outline first? Deirdra: Do you ever experience a snag in a story, a form of writer's block? If so, how do you deal with it? Nancy: I brain storm with my critique group. But now that I blog, I find the act of simply writing a post a huge benefit. If you’ve ever entered a blog-fest and couldn’t think of the beginning of your story entry, you will know what I mean. Just start writing, and it comes to you. Deirdra: Do you need absolute quiet to write? Do you listen to music when you are writing? Nancy: I would love to listen to music if I had a Bose sound system. As it is, music would freeze my computer. So I either have quiet when no one is here or the voices and noises of my family in the back ground. Sometimes I even have two 3 year olds jumping up and down beside me saying, “Meme, Meme, Meme…” that’s me. Deirdra: What kinds of inspiration do you use during your story creation periods? Nancy: My imagination is all I need. I don’t use photos of people because I like to sketch a basic outline for my readers, that way, they can insert their favorite image. The same is true with description, though there is more detail. Deirdra: Who has made the greatest difference for you as a writer? Nancy: Hands down my mother. She taught me to read. She taught me to love books. She encouraged me to write. And she understands the craft because she is also a writer of cozy mysteries. 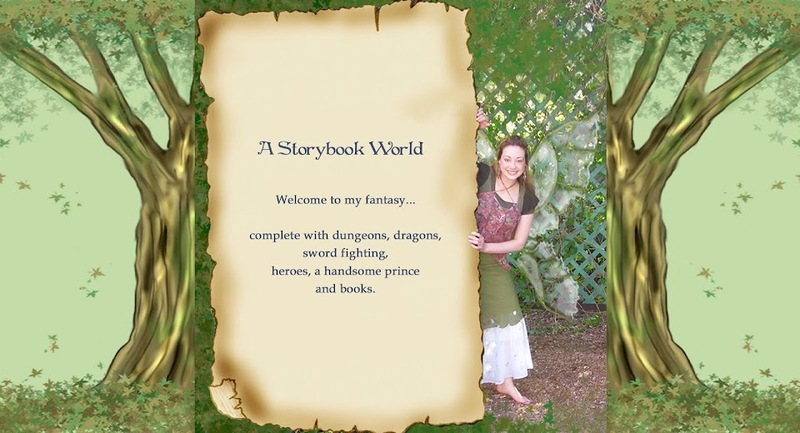 Deirdra: What’s your secret to making the character’s in your books come to life? Nancy: I care about their story, their goals and their motivation. I want the characters to have their own personality and not be cutouts from other stories I’ve written or someone else has written. In “The Treasures of Carmelidrium,” Missie, my heroine, is a modern American and reacts as a young woman of our culture would. Healden (pronounced with a silent “a” like Heather is pronounced), is a medieval prince and reacts like a skilled warrior and caring man. It’s not our medieval past…so expect surprises. Deirdra: What authors do you admire, and why? Deirdra: What is your favorite snack to have while you are writing? Nancy: Water. Ice water is a must. I get thirsty. 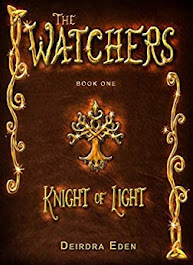 Deirdra: What words of advice do you have for other writers who desire to have their manuscripts become books in print? Nancy: Pursue the standard method but don’t ignore the e-book revolution. Deirdra: What are you working on now? Nancy: I am working on the sequel to “The Treasures of Carmelidrium,” and the first of my phoenix novellas. Deirdra: Where can our readers go to find your books and order them? 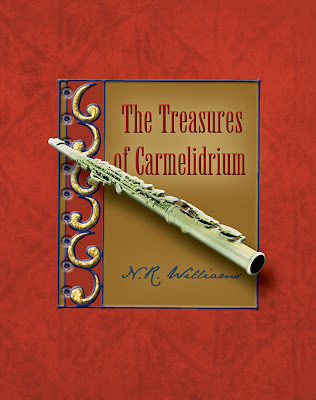 Nancy: You can buy “The Treasures of Carmelidrium,” from Amazon and soon at the iBookstore and Barnes & Nobles for nook as well as others. I hope to have a print version available later this spring. Deirdra: Any final words you would like to share? Nancy: Thank you Deirdra for being the first stop on my blog book tour. I hope your readers find my answers interesting and entertaining. Remember, I’m giving away 3 e-books at the end of my blog book tour, Feb. 1, 2011. For details see below. 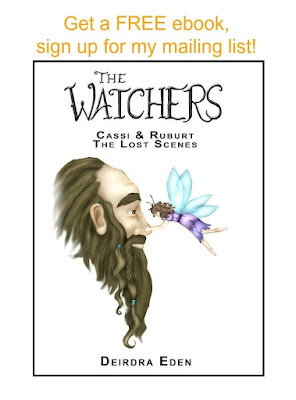 NOTE: Please leave your email to receive a free e-book. It was so nice to get to know you on a more personal level, Nancy. Everyone, THE TREASURES OF CARMELIDRIUM is a wonderful escape. I so enjoyed reading it Nancy. Good luck on your blog book tour. I love reading true stories about writers who overcame earlier difficulties. I've heard schools once did that, try to force everyone to be right-handed. At least they've stopped that. Thanks for the shout out Michael, you are a great friend. Susan, in my case I think it was an accident. Nevertheless, it isn't a good idea. I've been watching my grandchildren carefully and one of them is a lefty. I'll be sure the same thing doesn't happen to her. Thank you both for dropping by Deirdra's and leaving comments. I so appreciate it. Don't forget your email address everyone. I can't enter you in the contest without it. I loved your interview. We have so much in common. I lived in Colorado Springs for 5 years and had 2 of my 3 children there. I have a left handed brother who is somewhat dyslexic and went to a special preschool to help him with that while continuing to stay left-handed. My mother was the one who encouraged me to read and gave me the love of reading. My favorite is historical romance mysteries. And as you, I have 2 of my grown children living with me as well as 2 grandchildren. There is never a dull moment in this house. I do love fairies and fantasy as well. I look forward to reading your books. Enjoy your tour and I hope you have much success. This is a great interview! I enjoyed learning more about Nancy. Thank you Mary. I will definitely stop by your blog and read more about you. I'm glad Golden...so fun to see everyone's avatar to the side. Makes me smile. Great interview. It was great to learn more about you Nancy! Thank you Holly. I appreciate that. Hi Nancy - sorry I'm late to the party! I was interested in your comments about your critique group, and have picked up from other writers just how valuable a resource crit partners are. How did you go about finding crit partners? How important is it to be able to physically meet your crit partners? How do you sift through the comments to sort the wheat from the chaff? How much reading of their work is required? What a wonderful and inspiring interview. Actually I was the first to comment when this interview was posted and my comment had disappeared! I learn a great deal when hearing about all the hoops one has to go to be published and the e-route is so exciting right now. I wish you all the best for the tour, which I'm following with gusto and can't wait to read the book. Goodness Dom, those are important questions. I think I will collect questions and answer them in February where I will have more time and space to do them justice. Actually, due to several glitches, your questions are in the duplicate post below. But I will honor the fact that you came by again with another comment and give you two chances at winning the e-book. Margo left her email so I can put her in the contest. Thanks everyone, I appreciate everything and Dom, I'm excited to hear what you think of my book. I very much enjoyed this interview, thank you. I'm absolutely with you on the admired authors. I wish you luck with this book. I'm very much looking forward to reading it. It's a genre I enjoy. I too was an early poster (second) on this thread, but my post disappeared, so I'm not sure what happened there, but here I am again. The book tour is quite an undertaking, and this is somewhat educational for me, as I need to work on promotion, so I'm following what you do with great interest. You have planned some really interesting posts, so I shall follow it with interest. Great answers, Nancy. You have a long tour planned. Lots of chances to get to know readers! Yes L'Aussie, I have a lot of little helpers. I will answer those questions on a blog post Dom. That way I can give them justice. I'm glad you came back Tony, I will put you down for two since there were some glitches in the system. It is a bit long Helen, but I have weekends off to recuperate. I'm looking forward to it. Thank you all for stopping by and leaving a comment. I'm sure Deirdra appreciates it and I know I do. Great interview, Nancy! I, too, came perilously close to failing English in 7th grade from lack of ambition, rather than injury. I'm glad to say I overcame that sloth episode nicely. Good to see you Jeffrey. English is tough. I'm glad you overcame it. Another entry into the contest.